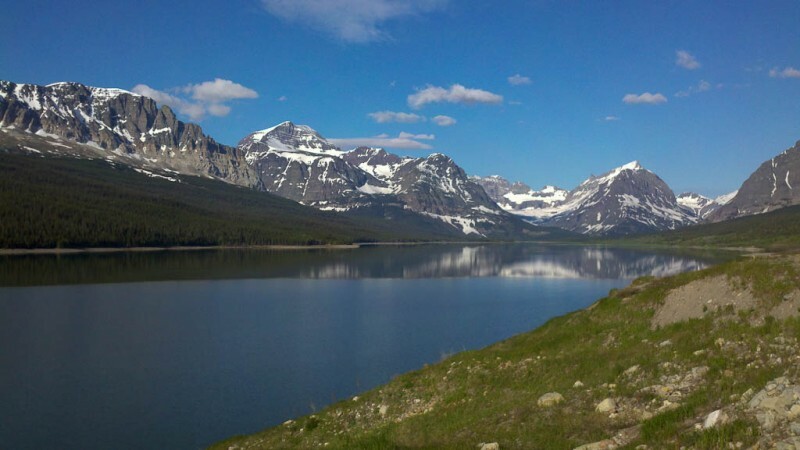 We drove from St. Mary North to a place called Many Glacier. It is an area, where at one time, several glaciers converged to create an interesting valley and Lake. 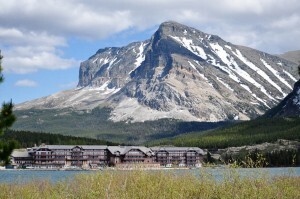 It is also the location of the Many Glacier Hotel, one of the few historic buildings still left in the park. In 1850, there were approximately 150 glaciers in the park. Today there are about 25. In 2020, it is estimated that they will all be gone. Glaciers normally go through build up and retreat phases but with a little help from global warming it will be interesting to see if and when they progress again. Even the ones still existing are hardly more than a large snow pack and are difficult to distinguish from this years snow accumulation. But, the valley’s, lakes and rock formations left behind are breathtaking. The park opened in 1910 and because of its remote location was difficult to get to. The owners of the Great Northern Railway Company thought if they built a Hotel it would be a great way to get tourists to use their railway. So, in 1915, they opened the Many Glacier Hotel. The hotel is currently undergoing massive renovations which I imagine is in preparation for some sort of centennial event. But, even with all of the scaffolding in place, I could envision the grandeur of the building when it opened. 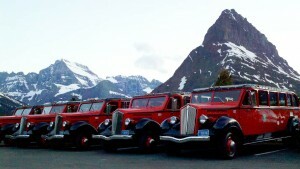 My favorite historical aspect of Glacier, however, has to be the Jammer Buses that are still in operation. The fleet of 33 tour vehicles built by Ford between 1936 and 1938 give one the feeling of times gone by but now, with an updated twist. The vehicles were taken out of operation in 1999 to be completely refurbished and returned with propane powered engines. Every time I see one on the road, I just smile. 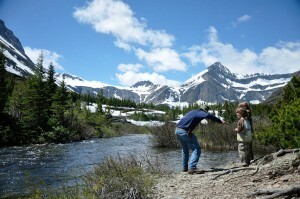 While at Many Glacier, we also took advantage of several of the Ranger talks offered at no charge to visitors. Some are held at the Hotel, some are held at an amphitheater in the campground. We attended talks on Moose, Wolverines and Glaciers. It was also a great opportunity to add to the Dudes learnin’. It was through these Ranger talks that I got the feeling that it is possible for man and beast to coexist peacefully in the park. 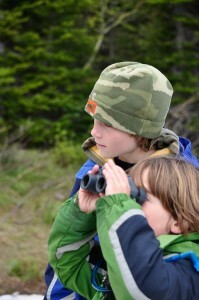 By educating the public in how to respect the nature and needs of the animals both parties can enjoy THEIR habitat. It appears to be working since many of the creatures we encountered acted as if the people were just another part of their environment. 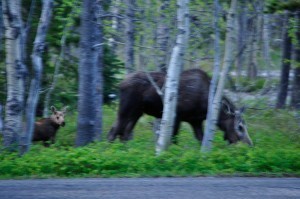 This information would also come in handy when a mamma moose(considered one of the most dangerous animals to come in contact with) and her baby moseyed on past our campsite. 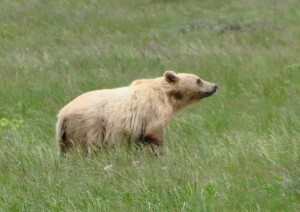 We had bear sitings everyday and bighorn sheep and mountain goats could easily be seen on the hillsides. 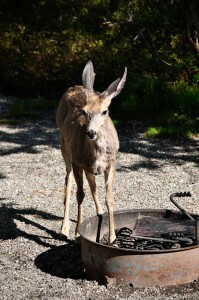 We were also visited every morning by mule deer who seemed to have taken a liking to burger drippings in the fire rings. We were taught to make your presence known to the wildlife(especially the bears) while hiking so that you don’t startle them creating an aggressive response. The best way to do this is with your voice. Some people come up with bear calls like “comin’ through” that they yell out regularly to let the bears know of their whereabouts. The bears, will then gladly, avoid you. We didn’t really need a bear call since the Lil’ Dude never shuts up. 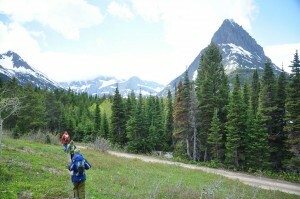 Glacier has over 700 miles of hiking trails and many of the trailheads start in the Many Glacier area. All of the trails we hiked had great views and waterfalls and except for one afternoon thunderstorm we had perfect hiking weather. We had originally planned two days in the park. We were now on day five and there would be more to come. This entry was posted in Dawn Deliberates and tagged Glacier. Bookmark the permalink. Awesome! That is so great that the weather, Park and wildlife gave you guys such a great experience. Not 2 hours after you left here we were starting to get some occasional sun, so i hoped it would find you. Never know with the Park and mountains. Great to have had you guys stay. Cheers! Yes! We really lucked out and loved the park. You guys need to plan a trip this summer. It’s just up the street! Thanks again for the hospitality! Just catching up after missing a few of the blogs. Your stories and pictures always make my heart happy, and I smile and laugh all the way through. Dawn – so awe inspiring Glacier is! Pretty cool – my wife and I took that Avalanche Lake trail over 14 years ago and the one memory that sticks with me from that trip is that very shot of your guys looking at that beautiful amphitheater at the edge of the lake. Awe inspiring, yes! And, so glad you could relate. It is a very special place.